It’s not that rare that people destroy or damage something because they’re too submerged in taking a selfie. The latest case took place in the group exhibition by artist Simon Birch, at 14th Factory in Los Angeles. A woman crouched down in front of one of the pedestals trying to take a selfie. She knocked it over, and it caused a domino effect that’s painful to watch. 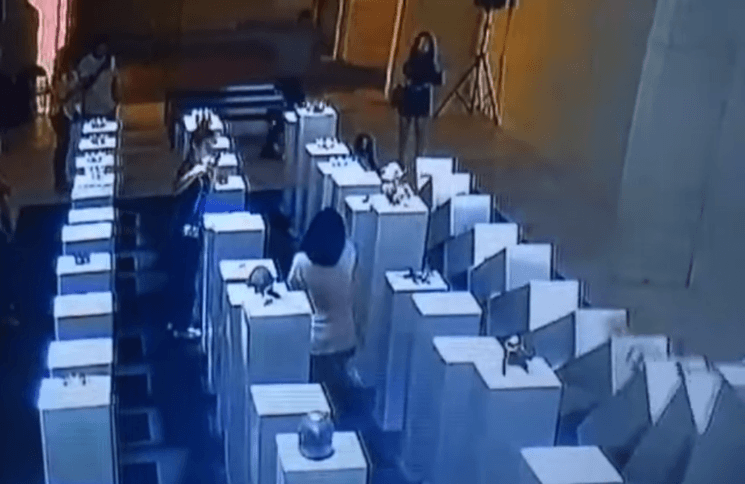 All the pedestals in the row fell down, and some of the art pieces got broken. $200,000 worth of art pieces. The installation features crown-like objects placed on top of the pedestals. Even though some of them are made from metal, wood and nylon, the others involve more valuable materials like gold, silver and marble. Gloria Yu, one of the artists featured in the exhibition, tells Hyperallergic that “three sculptures were permanently damaged, and the others to varying degrees.” She shared the information that the approximate cost is $200,000. Now, I am annoyed by people takings selfies and not noticing the world around them. I’m especially annoyed when they do it in a gallery or a museum. But I guess that’s my problem because I still prefer enjoying the moment, and those hitting me with their stretched hands and selfie sticks ruin it for me. But still, I can’t really bash this woman too hard. First of all, the exhibition is designed for “Instagram generation.” Carolina Miranda of the LA Times describes the exhibition as “the perfect place for an Instagram.” After all, in the age of social networks, I guess you can’t expect people not to snap photos and use their phones (no matter how much it may annoy you). There’s another thing why I can’t only blame the clumsy woman for this mass destruction of the artwork. I wonder why the installation isn’t protected with velvet ropes. If the crowns are that valuable, they shouldn’t be exposed to everyone’s hands (and butts, in this case). So what I’m saying is: this could have been prevented. Not only by a selfie-taker who should have been more cautious, but also the gallery who should have protected the installation. All in all, I hope this will serve as a reminder that taking selfies at an art exhibition isn’t really the best idea. It’s not only annoying for others and prevents you from enjoying the exhibition – but it can also cost a lot if something gets damaged. 200’000… hahaha yeah right. besides, this was most likely staged. “As part of the exhibition Birch, who survived brain cancer, filmed the destruction of his $50,000 Ferrari 308. Ignorance is no excuse… With that said, she should work in a community service capacity to minimize the losses she’s forced the artist and gallery to incur. I think the whole thing is performance art. I want in on this type of gig. How do you actually convince people that THAT is worth 200,000? They can have the crown market. I’ll do ducks or wrenches or something. They’re much more complicated so worth more right? It should serve as a reminder that installers of art displays shouldn’t create stupid domino-prone arrangements. Good! Next time they will fix those stands better. It is 200,000 worth. You can`t judge the price, cause you are not the target group. What is the price for a picture made by Gursky or Mr. Nobody. If there is someone who is able and willing to pay the price, it is the worth of the artwork. And it is not the task of the gallery to take care, it is the task of the visitor. Cause a gallery is not a museum and clients wannt to be close to the artwork, when they want to buy the artwork for 200,000. The clumsy woman – and only the clumsy woman – is to blame for the destruction. Not believing for a minute. That was set up to fail. Or the organizer/curators were first timers that had no business setting up an exhibit of any kind. A real exhibit would have insurance against such mishaps, and the insurer probably would not cover the installation as presented. Yeah, whole story could just be a publicity stunt. I wonder about the ease with which the other pedestals were toppled. First, the “art” is crap. Second, the fault lies squarely with the fools who placed the art on top of dominoes and then invited people to mill around them. Pedestals should’ve been anchored to the floor. Seems like a lousy set up to me. Could have happened with some bumping a pedestal, this is nonsense. The price for that art ridiculous. Publicity grabbing headline just to fill space.